The Classic man winning in the Classic race....Classicly! 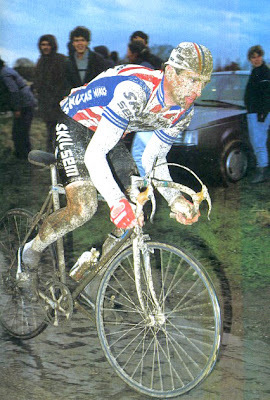 Twenty five years ago, in 1984, Sean Kelly won his first Paris-Roubaix. The twenty-seven year old with the Skil-Sem team bided his time picking carefully through the many crashes & pavé to avoid falling. Muddy wet conditions seem to work for the tireless Irishman. He seem to enjoy the apocalyptic pavé. The bigger the better. Or at least, worse for his foes. After the 1960's, many of the cobblestone roads were paved with asphalt, so the organizers turned the latter part of the race to small farm roads and forest trails that date from the Napoleonic era. L'Enfer du Nord, the hell of the North was born. A few days before, Kelly had just won Spain's demanding Tour of the Basque Country under very wet & cold conditions and he was looking forward to the same in Roubaix. He wasn't too disappointed. At the infamous Wallers-Arenberg forest, puddles formed due to the previous week's heavy rains. The sun rarely shines through the heavily lined trees to evaporate it. Kelly effortlessly powered his way through with only one adversary in tow, second year pro Rudy Rogiers. At the velodrome in Roubaix, Kelly easily outsprinted Rogiers for victory. The Irishman started his career and lived in Belgium. For he had fans in Belgium who adopted him as their own. With his win, Sean Kelly moved up to the sport's elite. A great champion twice; one for Ireland and one for his adopted ... Belgium!